This review charts the progress and development that we have made here at Plymouth University – thanks to our staff, our students, our alumni, our partners… our people. The year has not been without its challenges, both from within the sector and beyond. The important thing is how you respond to challenge, how you adapt and move forward. And move forward we have. Perhaps the defining theme for the year has been our strong focus upon the core activities of the University: teaching excellence and high-quality research. It is these that are both the pillars and lifeblood of academic institutions. Of course, we have also given great focus to those activities that support these endeavours. These include new state-of-the-art facilities to support teaching, research and student wellbeing; a digital learning environment that crosses the boundaries of our campus; and a programme of curriculum enrichment that is transforming our student learning experience. These changes are all designed to enable our people to flourish and focus on what they do best – teaching, learning, researching, questioning and collaborating – as you will see from the abundance of examples included within this annual review. Centre of Excellence for research into lowgrade brain tumours. cast of thousands at graduation 2014. October - THE PIONEERING CUMBERLAND GP PRACTICE, the first to be run jointly between a university and an NHS primary care provider, celebrates a major milestone when its 1,000th patient registers. November - THE CURTAIN RISES on the University’s £7 million performing arts centre, The House, opened by acclaimed choreographer Russell Maliphant. December - NEARLY TWO-THIRDS of the University’s research is graded as world-leading or internationally excellent in the 2014 Research Excellence Framework. 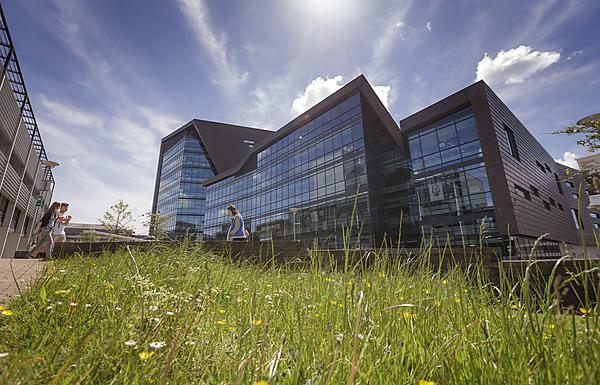 January 2015 - TOPPING THE PEOPLE & PLANET GREEN LEAGUE for the second time, Plymouth is ranked the most sustainable university in the country. February - PLANS ARE CONFIRMED to redevelop the Plymouth Science Park, a hub for high-growth IT and digital businesses, creating 190 skilled jobs for the city. March - THE UNIVERSITY OUTREACH TEAM welcomes around 1,000 visitors aged 6–12 to the University as part of British Science Week. The young people explore the latest research and learn about ‘pyromania’ chemistry, marine ecosystems, robotics and engineering. April - THE UNIVERSITY ACHIEVES its highest ranking yet in the Times Higher Education 100 Under 50 league table – placing 37th in the world and fourth highest in the UK of those institutions under the age of 50. May - UNIVERSITY SCIENTISTS are at the centre of two major biological discoveries, with Dr Robert Puschendorf among a team that discovered a new species of glass frog in Costa Rica, and Dr David Bilton, Reader in Aquatic Biology, identifying a new species of diving beetle in South Africa. June - MORE THAN 5,000 PEOPLE flock to the campus for the Big Festival Weekend. The occasion offers a huge range of events and activities, and also incorporates the Plymouth Respect Festival and HOT ’15 arts degree show. July - SENIOR FIGURES from the South African government visit the campus to meet University leaders and academics across science, engineering and business sectors and discuss potential collaboration opportunities.